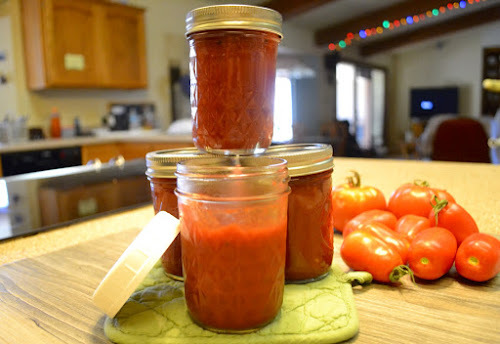 Over at Julie's: Tomatoes and Canned Homemade Ketchup with a Kick! I was looking for a creative way to use my first batch of homegrown San Marzano and Early Girl tomatoes and decided . . . KETCHUP!!! I perused through all my canning cookbooks . 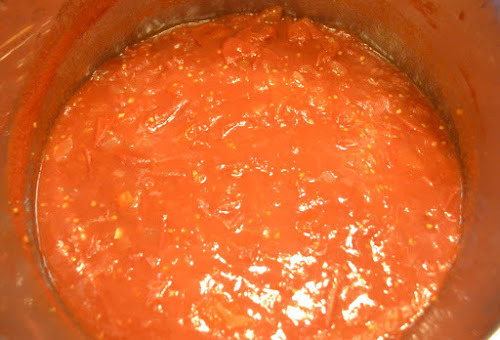 . . browsed the web, including YouTube, and found all sorts of recipes for making tomato ketchup. There were videos using tomato paste, water, garlic powder, onion powder and spices . . . recipes with an Indian flare, mild ketchup, spicy catsup, copy-cat Heinz ketchup, southern ketchup, sweet, savory, even top secret . . .
Will and I really wanted a ketchup similar to everyones' 1st choice, Heinz Ketchup, but with a bit more kick, like my childhood favorite, Brooks Ketchup manufacturered in Canada. We did a lot of taste testing while I was cooking the tomatoes down, and again after I put the cooked tomatoes through the sieve. I was busy adding a bit of this and that, jotting it down, taste testing, tweaking the heat, sweet, spice, acid, and saltiness. We ended up with a thick, gourmet, spicy ketchup that goes perfect with my oven baked fries! The best part? I used my very own homegrown tomatoes, that I started in the house from seeds! There is no high fructose corn syrup, MSG, or any other questionable ingredient or chemical present . 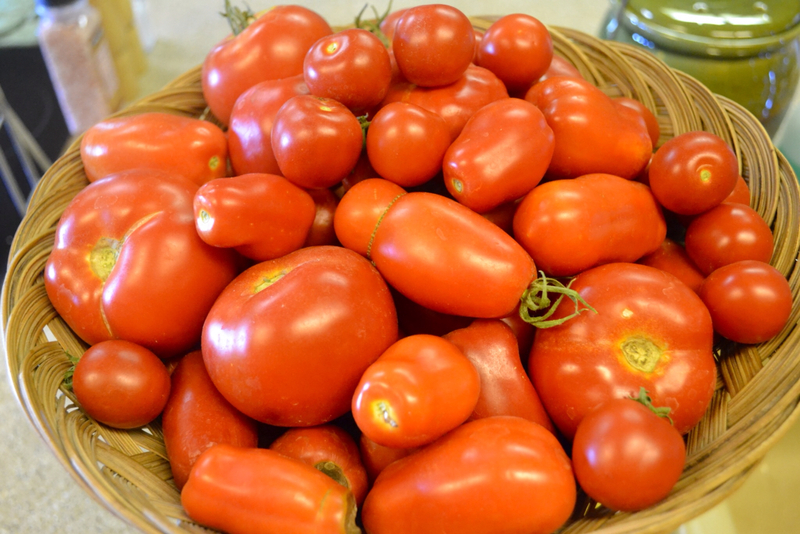 . . Just fresh organic tomatoes, herbs and spices, vinegar and pure cane sugar and organic blackstrap molasses. Place chopped tomatoes, chopped onions and minced garlic in a large stainless steel or enamel pot. Bring tomato mixture to a boil; reduce heat and simmer for 25 minutes. Meanwhile, in a small saucepan add vinegar; wrap celery seed, cloves, cinnamon, mustard seeds and whole allspice in a double thickness of cheese cloth, making a bundle; tie with cotton string. Bring vinegar to a boil; remove from heat and allow spices to steep for 25 minutes. Pour seasoned vinegar, brown sugar, pepper sauce, cayenne, salt and pepper into tomato mixture; stir, and simmer for an additional 30 minutes, stirring every 5 minutes or so. TIP: My days are full, so at this point I allowed my pot to cool; refrigerated it over night and in the morning I put my tomato mixture through a sieve and continued simmering it, until it reduced and became thick, like bottled ketchup. Put tomato mixture through a sieve or food mill. Return to low heat and simmer for 2 hours; stirring often, until ketchup becomes thick. TIP: This is about making a gourmet ketchup . . . Taste often, adding a bit more salt, heat, sweet, or vinegar to suit your tastes. Just be sure to add small measured amounts. If you over-season you can't remove it! Fill hot water canner with water; add your four 1- cup canning jars, lids and bands to sterilize. Remove from pot, one at a time. After you fill a jar, return it to the hot water bath. Fill jars with hot ketchup, leaving 1/2-inch headspace. Wipe rims with a damp cloth. Adjust lids and screw on bands. Process in a hot water bath for 10 minutes; add an additional 5 minutes for over 1000 feet above sea level. Fresh tomatoes (with skin still on) chopped and ready! 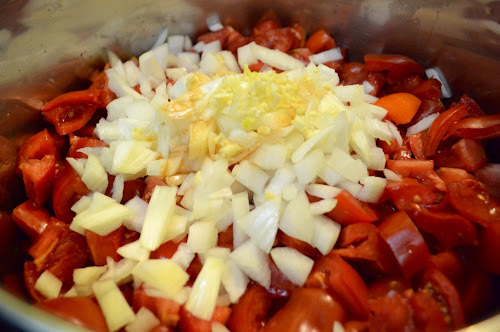 Simmer tomatoes, onions and garlic for 25 minutes. 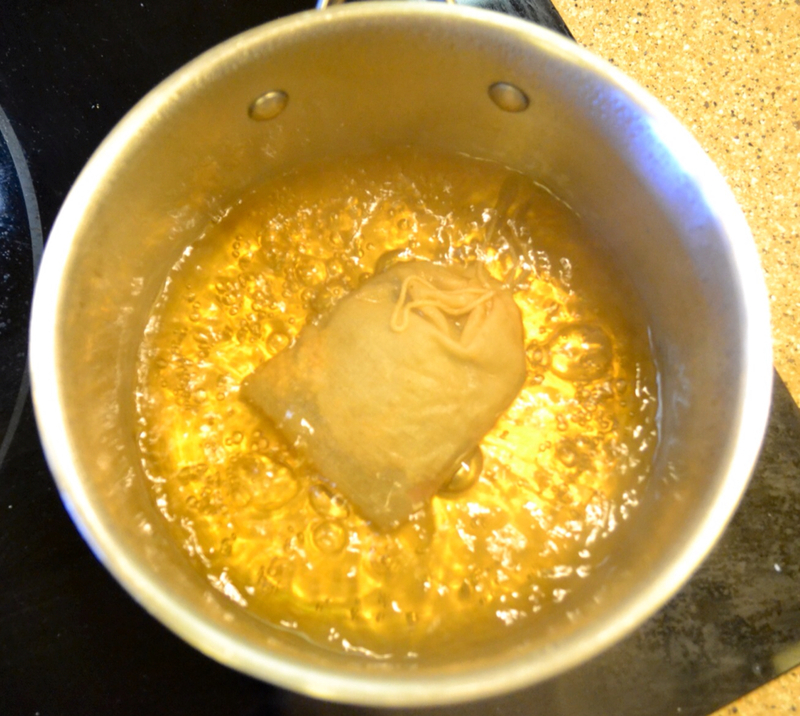 Bring vinegar to a boil; remove from heat, cover, and steep spices for 25 minutes. 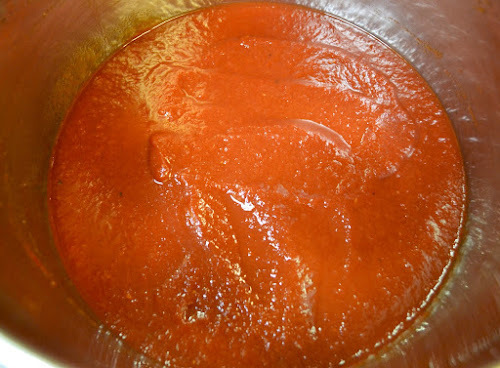 Tomato mixture after 55 minutes of cooking. Use a sieve (like the one above), a food mill or, push tomato mixture through a fine metal sieve, using the back of a large spoon. 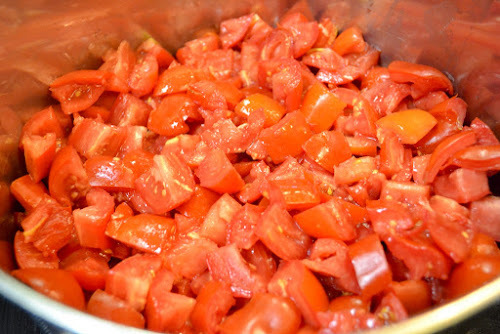 At this point tomato mixture has become a spicy tomato sauce after being forced through the sieve. I processed 3 jars and just put a plastic lid on the ketchup we used with our homemade fries. 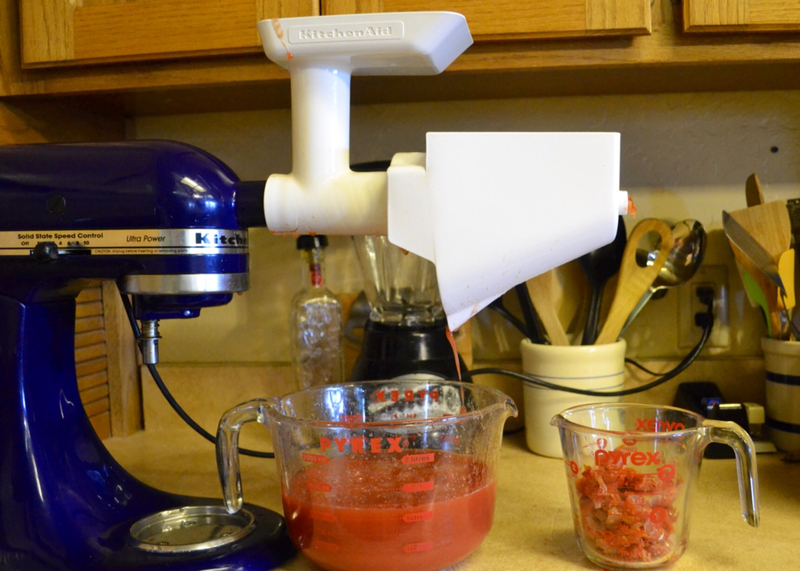 Yes, it takes a while to make ketchup from whole tomatoes. No, I'm not crazy for going through all this for just a quart of ketchup! I just added this job to my busy morning routine. I was at home doing laundry, watering the garden, making cold processed soap and homemade bread, so most of the time I was already in the kitchen to keep an eye on the pot. When I wasn't able to give the ketchup a quick stir, Will seemed to appear out of nowhere, and was happy to take a turn at the stove for a stir and taste test . . . Over at Julie's!!! 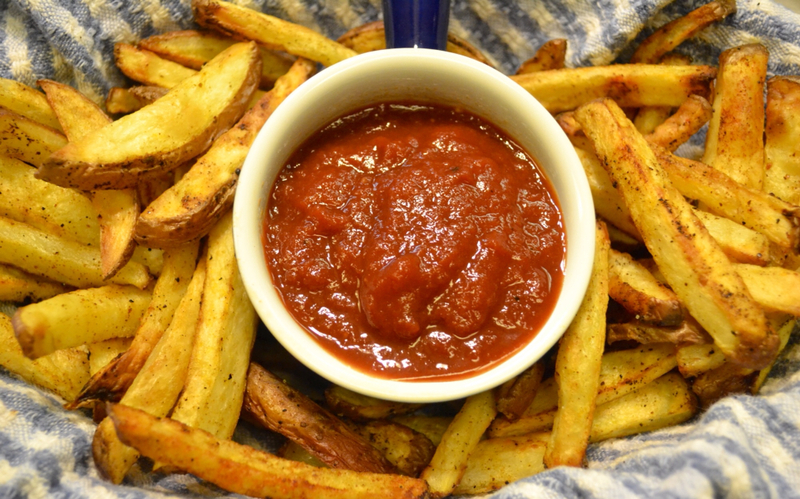 We tried out our new ketchup on some oven baked red potato fries . . . The verdict? Totally awesome! Thanks! This summer I made a double batch! We just needed more! I also tried my hand at making peach ketchup with some tomatoes added for color . . . The flavors in homemade are so intense . . . It's like bottling summer up in a jar!